There was one day during that week that was a particularly busy one, and I never had time to stop and eat lunch, so the only thing I really got that day until dinner time was some of the bread from VBS. While it didn’t have much in the way of protein, it did sustain me through the day until I got home to make dinner. I depended upon that bread as the main meal for the day. My lunch that day hearkens back to the time when bread was the mainstay of most people’s diets. Bread during Jesus time was the basic item for everyone’s diet. Bread was such a staple, that the word for bread in the Lord’s Prayer, also means food in general. Often times, especially for those who were poor, meals consisted of bread and little else. I experienced this first hand while working in Nicaragua on a mission trip years ago- Our meals almost always consisted of a tortilla, and for many Nicaraguans, they might eat a tortilla with some salt, and if lucky, some beans as their meal for the day. The tortilla was the main staple, the bread of life for the people of that country. In our passage today from John chapter 6, Jesus tells and shows his disciples what it means that he is the main staple, the Bread of Life. Here Jesus used an important everyday necessity as an illustration- bread, and told the disciples and crowd what it meant to feed people spiritually, and how they should not work for food that does not perish. This passage happens to come just after Jesus has fed thousands with bread and fish, with some left over. Although the crowd rightly interpreted the miraculous feeding as a sign that Jesus was the Messiah, they missed Jesus’ more fundamental point. They wanted to be near someone so powerful, part of the in crowd. They probably brought their friends to see this miracle man who could take a little bread and feed a whole village. They were entranced with what Jesus could do. But he told the people that they should not come to him because they wanted their fill of bread that would eventually digest, leaving them hungry again. Bread was important, but this wasn’t what life was about. Instead, Jesus told them to seek him for the right reasons, because he is the Bread of Life, and what he offers will never go away. Jesus told them to stop grumbling, and let them know that he truly was Messiah. He said, “No one can come to me unless drawn by God who sent me; and I will raise that person up on the last day.” Jesus claims here that it is God, working through him that brings people to follow him. And by claiming the power of resurrection, Jesus says that he and God are in effect one. What does this teach us today? As we talked about in our Bible study on this passage last week, Jesus reveals the truth of who God is through his teachings and his earthly life. We can understand more of who God is by learning about Jesus. What can be said about Jesus’s proclamation, that he is the Bread of Life, that he is the staple, the mainstay for this world? How does this statement apply to us? The first thing to consider is whether or not we are using this staple of spiritual life. Are we using Jesus as the great spiritual resource- he who is living bread? Recently, as a way to lose a bit more weight, I’ve often skipped bread as a part of my meal. For example, if I go to the Wendy’s here in town, I often get a burger without bread, wrapped in a lettuce leaf. Unfortunately, sometimes as Christians we put ourselves on a spiritual Atkins Diet. We cut out all the bread of life by not putting aside time to pray, time to study the Bible and Christ’s teachings, time to participate in the sacraments, time to worship with the community, time to go out and minister in Christ’s name. If we are hungry for God, we can’t skimp on the bread. It is an unhealthy spiritual diet, and we will lose spiritual weight. If worship, study, prayer and service are at best a third or fourth priority in your life, or in your family’s life, you will find yourself starving spiritually. 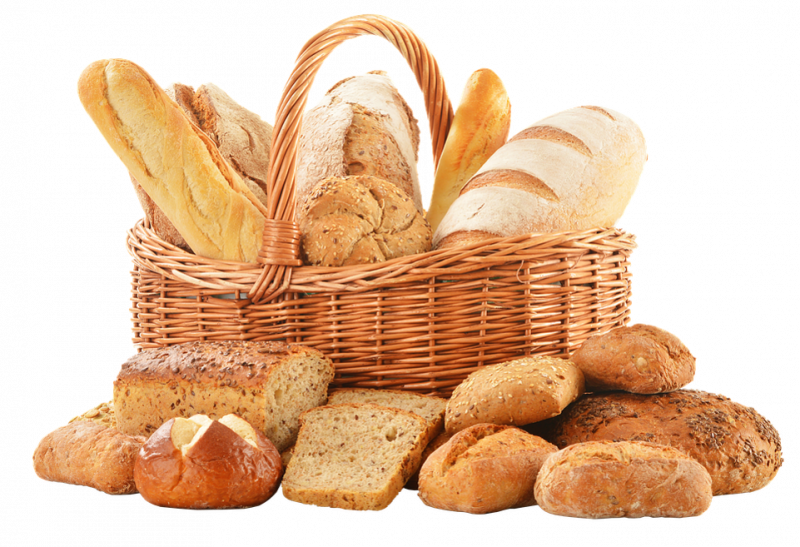 We need bread that lasts, bread that sustains us in those times of sorrow or great hardship. Christ is the bread of life for such times. Whenever we have had a memorial service here, I find Jesus to be bread that sustains those who have lost a dear and cherished member of their family. Jesus says in John 14:1-4 “Don’t let your hearts be troubled. Trust in God. Trust also in me. In my Father’s house are many rooms; if it were not so I would have told you. I am going there to prepare a place for you and if I go and prepare a place for you, I will come back and take you to be with me.” Jesus also said in John 16:22, “So now you are sad, but I will see you again, and your heart will rejoice, and your joy, no one will take from you.” This is bread that lasts, that helps us and sustains us through the dark valley of loss and mourning. Presbyterian minister Richard Christian Halverson said, “Jesus Christ is God’s everything for our total needs.” I have been sustained by the bread of life in the death of our first child, in the death of both of Paula’s parents, and more recently in the deaths of my own father and mother. At my first ordained call in Sacramento, I was sustained by this living bread in gathering with a family whose 3 year old son had just drowned in their backyard pool along with his 4 year old cousin. It was an incredibly difficult day for that family and for me as their pastor. Yet Christ got me through, giving me words to say and sustaining me with his presence. Jesus Christ is my everything, for all of the difficult times that come in this life. He is bread that lasts, and gives hope even in the darkest valley of the shadow. This leads us to the second thing to ponder- If we eat from this living bread, we ourselves can find spiritual strength and in turn become bread for the world. The bread of life can help us go out into the world and do the ministry of Christ, because we are strengthened in our faith through Jesus, the true bread of life. I have had the chance to be that living bread for the world many times. In 2006, I had the blessing of being bread by participating with members and pastors from a number of churches on the Northern Ca. coast on a disaster relief trip to Waveland, Mississippi, after Hurricane Katrina. We went because we had all been fed the bread of life by Jesus, and because Jesus called us to go and help, to go and show our love, our faith and compassion for people in need. I still remember getting off the plane in New Orleans late at night, and as we were getting our baggage and preparing to get into our rented vans, there was another disaster relief team from Presbyterian Disaster Assistance, with matching shirts. They spoke with my wife, Paula, and she let them know that our team was a mixture of two different strains of Baptist, Presbyterian and non-denominational folks all working on the same team. The person from PDA said to Paula. “Wow- Good luck with that!” And yet, we worked together for over a week, laying theological and denominational differences aside to be bread-helping rebuild homes, laying foundations and providing some spiritual care for so many whose lives were devastated by the powerful storm and flooding. We were also the bread of life just listening to people’s stories. Some of the folks we listened to were so thankful that we cared enough to stop what we were doing, and listen. I remember one older gentleman named John, who out of thanks for listening to his many tales of the hurricane, gave my son Sam a Jean jacket. It was a powerful experience, which I’ll not soon forget. That was a great experience of being bread for others. Yet we don’t necessarily have to travel to a disaster area to be bread for the world. Helping with the winter shelter for those without homes, cooking a meal for the community dinner, praying for someone, making a phone call to a friend who is hurting, giving a sandwich to someone who is hungry, telling someone about your faith and the love of Christ, visiting someone in the hospital or who is lonely, giving food to the Food Bank in love, helping a grieving family through their loss, trying to be a peace maker in a world at war, driving kindly on the road, saying hello to someone, looking service workers in the eye and really seeing them- all of these are some of the ways in which you and I can be bread. When we experience the Risen Christ in worship, we are given everlasting bread that sustains us and strengthens us for service to others. This is a bread we all long for, deep within our souls. Sometimes, though, we forget how hungry we are. Sometimes we say we just don’t have time to stop and eat, and that spiritual longing grumbles deep down within. Let Christ fill your spiritual longing with purpose, strength and hope! As we gather around this table today, we are each offered the bread that lasts forever, which sustains us and fills us with all we need for living, and which allows us in turn to be bread for others, feeding the world with God’s love and compassion. Thanks be To Jesus Christ, the bread of life! Alleluia! Amen.